Actual sight seeing tour was ok - seem to go around in circles alot. Need to offer water or the opportunity for passengers to buy water as was extremely hot. Camel sunset ride was awesome, operators were very friendly and professional - loved camel ride. This was an awesome experience! Even though the weather was overcast, the joy of trekking along the shores of the Indian Ocean in a camel caravan made for vivid memories which we will never forget. Steve, Adrian and Jeremy were fantastic. Steve had a definite rapport with each of his camels and could speak their language. Jeremy was the lead guide, assuring the caravan stayed on course and proceeded in a nice, comfortable pace. Adrian served as a our walk along guide, taking the time to be aside each of the camels in the caravan to answer any questions and provide insight to the passing scene. He even was so kind as to use each traveler's camera to take personal shots of them to assure clear photos of them as we traveled! We highly recommend this tour. Due to this tour being cancelled by the company on our first full day in Broome and changed to the last day of our holiday, it still did not deter us from enjoying this city sightseeing tour of the town. Our first stop was Sun Pictures which is the oldest operating indoor/outdoor theatre in the world. Then on to the the Cygnet Bay Pearls showroom for an interesting insight into the pearling industry. A viewing of the dinosaur footprints were also on the agenda at Gantheaume Point just outside of town before a welcome tasting of cold beer at Matso's brewery. To top it off we went on the optional camel ride which was just lovely at sunset and worth while taking part in. Our bus driver and guide for the afternoon was Lindsay who did a fabulous job, well done. The tour was a wonderful experience except for 4 things. The tour guide was a little side-tracked and constantly talked about his sore back whilst travelling on the bus. So when we got to some of our destinations we sat in the bus hearing the tour commentary we should have been hearing on the way. 1. The Sun Theatre was the first example of this. We sat in the bus for almost 10 minutes before going in. 2. The Pearl shop visit was too long, the shop representative gave a talk about farming pearls but he was very slow and repeated himself so it was way too long. As soon as he was finished our guide literally kicked us out of the shop. 3. I am not a beer drinker I had been looking forward to getting to the pub to taste their fruit beers I had heard so much about but again too much time was spent in the bus outside the pub listening to the guide. Those of us who were doing the camel ride literally walked in drank our 2 samples and had to leave straight away. 4. The last things was during the camel. The actual ride, the camels and all the staff handling them were extremely nice, friendly and professional except the man in charge of the camels. He was the one who helped everyone get off the camels after the ride. Mounting the camels was no problems, you just get on exactly like a horse and as I ride my horses almost every day of the year, not a problem at all. However when it came to getting off I expected to get off the same way however he would not let me. He insisted to the point of leaning over the saddle and pulling my right foot up and over the camel even though I tried to explain to him that as I had a back problem I should get off the same way I got on but he insisted and forced my leg over the camel as he wanted. This of course let me in some pain but his attitude was that he didn't care!! Even his staff standing behind him were not allowed to help me. So that was not a good finish to my day and overall I was a little disappointed in the tour overall. And so where the camels excellent tour to take on boad,good sightseeing including tour operators. 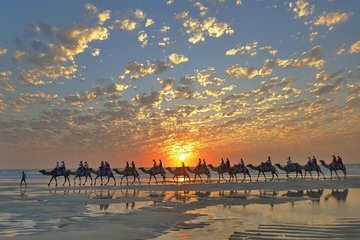 Camel ride at sunset n Cable Beach is definitely a bucket list item. Enjoyed the tour i hadn't,t been to Broome for years and so much has change so going on this tour helped us get our bearings. Particularly enjoyed the Cygnet Bay Pearl talk and the old picture theatre. Grantheum Point was a bit disappointing. We did the sunset camel ride and would recommend this. Great tour guide throughout Broome to the best spots with interesting histories. Recommend it. The camel ride at sunset was the highlight of this tour. That was amazing and I would recommend this to anyone visiting Broome. Cable beach would have to be one of the best beaches I have every visited. And This is from someone who lives on the Gold Coast of Queensland. A bit of a hassle finding our bus in the dark but all well in the end. The earlier bus tour was interesting but I wouldn't say exciting. Loved the pearl section of the tour. Would have liked to see a bit more scenery though. This tour covers Broome's must-sees. I found the presentation about pearls very interesting. My highlight was the camel ride though. It's a good tour but there isn't enough time for the sights visited.